“She’s Funny That Way” was the fourth and final Viennale-preview at this years “Kino wie noch nie” open air cinema festival, and it proved to be absolutely perfect for a warm summer’s eve. It doesn’t ask you to strain your brain, it’s not particularly sophisticated and/or thought-provoking, and it doesn’t revolutionize cinema in any way. What it does, however, is entertain. It’s perfect, light summer fare – at least if you’re willing and able to go with it. One thing that you should be aware of beforehand is that this is a very old-fashioned movie. While it’s obviously set in the present, it very much harks back to the good-old screwball comedies of the 30s and 40s. Which not only shows in the dialogue, but also in the huge amount of coincidences, misunderstandings, and mix-ups that are featured here. The world of “She’s Funny That Way” really is rather small, and everyone seems to know or be somehow connected with anyone. In this regard, the movie completely abandons any form of realism in favor of a good yarn (seemingly following Mark Twains advice “Never let the truth stand in the way of a good story.”). Plus, the fact that the whole story is framed with the interview that the newly-crowned movie star Isabella gives to a cynical reporter, immediately puts the truthfulness of her tale in question anyway (especially given her fondness for embellished stories). Because of that, the questionable plausibility of it all wasn’t really a problem for me. I just sat back and enjoyed the crazy galore of coincidences play out in front of my eyes. In that regard, the script is very clever, and offers up a couple of nice twists and turns. As usual with screwball comedies like that, the scenes where many of the protagonists get together (coincidentally, of course) at the same place were especially funny. My favorite moments of the movie were the audition, as well as the dinner in the restaurant. Those really offered a lot of laughs. The rest of the movie’s very funny, too, but I felt that this was its high point (since one thing that’s so funny about movies like that is for us, the audience, to find out how they’re all connected, and of course later, when the characters find out themselves). If there’s one scene that fell a little flat for me, it’s the scene near the end, with the rehearsals at the theatre. I don’t know, it just missed something, and I didn’t think it was especially funny and/or clever. Also, in trying to outdo themselves, I felt that Bogdanovish and Stratten wrote themselves into a corner, and the result felt a little forced to me (while all other gatherings before it, despite their implausible nature, always felt organic). The other big problem of the movie is Imogen Poots accent. Now, mind you, I’m not a native speaker myself, thus accents usually aren’t an issue for me, because more often than not, I don’t even notice it if someone sounds wrong for the area he’s supposedly coming from. Here, however, the problem was rather that Poots New Yorker accent sounded incredibly exaggerated and phony to me. And while I usually don’t use IMDB boards as a reference (since you can find a lot of junk and absurdities there), given the fact there are a couple of folks there who also noticed that, I guess I’m not alone (in the matter of full disclosure, however, I should point out that I know Poots from other roles, and thus know her genuine british accent – which might have oversensitized me in that regard). Apart from that, though, I really liked her performance. Her standout-moment definitely was the aforementioned audition, however, she was also very charming during the rest of the movie. I also enjoyed all the other actresses and actors, especially Kathryn Hahn, Owen Wilson and Rhys Ifans. Some might criticize some of them for overacting, but IMHO, with a comedy like that, where they rather play exaggerated caricatures than real people, that’s very much the point. 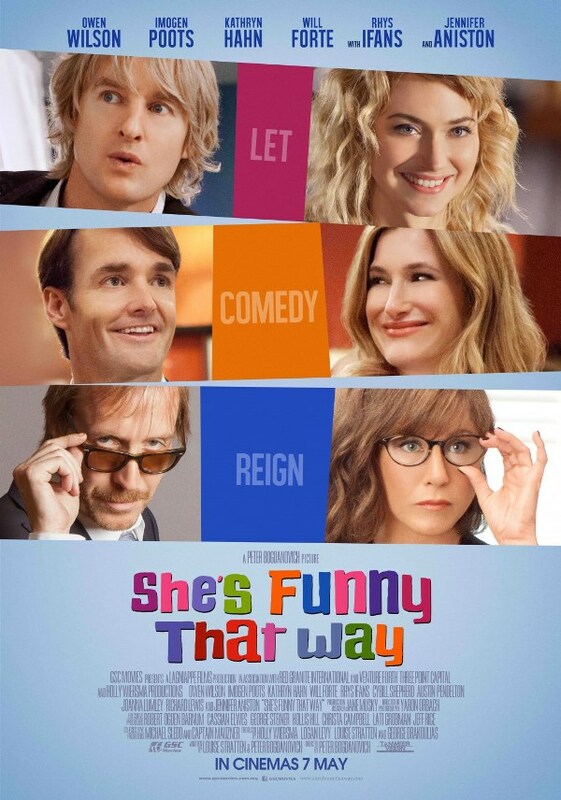 Overall, I really enjoyed “She’s Funny That Way”. It’s nothing revolutionary, but it’s a very funny, charming and old-fashioned movie that belies the age-old saying “They don’t make them like that any more” – because Peter Bogdanovich did. And a good thing, too! This entry was posted in cinema 2015, movie reviews, new releases and tagged comedy, Imogen Poots, Jennifer Aniston, Kathryn Hahn, Owen Wilson, Peter Bogdanovich, Rhys Ifans, screwball, She's Funny That Way, Will Forte. Bookmark the permalink.